Cookies for breakfast? Sign me up! 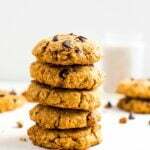 These sweet potato breakfast cookies are super easy to make, delicious and great to have on hand for an on-the-go breakfast. Add 1 cup of oats to a blender or food processor and process until the texture is similar to quick oats, almost oat flour. In a large bowl, combine the oats, processed oats, almond flour, cinnamon, baking powder, salt and ginger. Whisk to blend. In a medium bowl, add mashed sweet potato, maple syrup, coconut oil and vanilla. Pour the liquid mixture into the flour mixture and stir until just combined. Gently stir in pecans and chocolate chips. Use a large cookie scoop to scoop dough onto a baking sheet lined with parchment or a baking stone. Use your hands to form the dough into a round, flat cookie shape. Add a few chocolate chips on top if you’d like. Bake until the cookies are golden and firm around the edges, 25 to 30 minutes. Cool the cookies on the baking sheet on a cooling rack for 10 minutes, then carefully transfer the cookies to the rack to cool completely. Keep leftover cookies at room temperature for up to 2-3 days or in the refrigerator for up to 5 days. For the baked sweet potato, wash your sweet potato and use a fork to poke several holes in the sweet potato. Place on a baking sheet and bake at 400°F for 45 minutes. Cool, remove skin, and mash with a fork or puree in a blender. Can be made up to 4 days in advance. Inspired and adapted from Run Fast Eat Slow.